With a steep sided river valley at its heart, Newcastle-Gateshead (Newcastle on the north side of the River Tyne, Gateshead on the south) must be something approaching paradise for the bridge enthusiast. 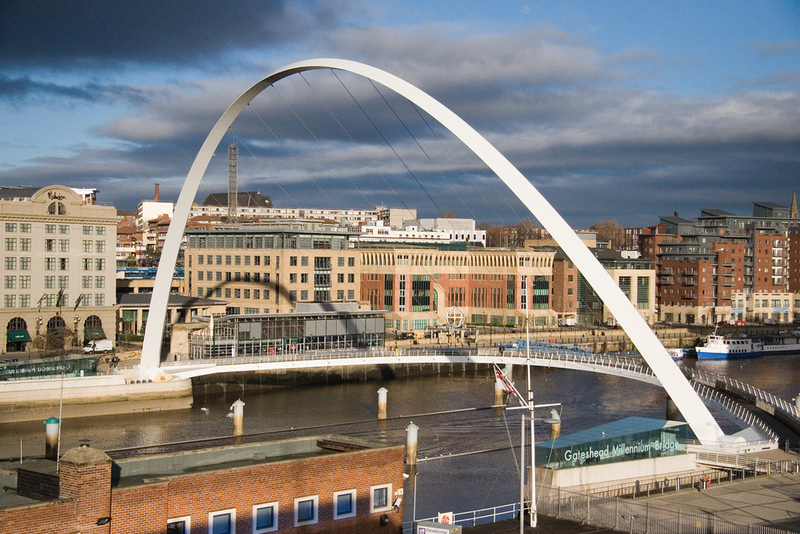 At the heart of this twin-city conurbation in the north-east of England, the Tyne is crossed by seven bridges at high and low levels within a remarkably short length of river. They embody a wide range of styles and ages. The double-deck High Level Bridge of 1849 crosses the river on elegant and lofty stone piers, while the 1981 Queen Elizabeth II Metro Bridge, a metal truss bridge on concrete pillars, provides passengers with one of the most extraordinary experiences to be had on any metro network. And then there is the Tyne Bridge of 1928, a beautiful through-arch bridge which has become an icon of Newcastle, much as the Harbour Bridge (which has many design similarities with the Tyne Bridge) has become an icon of Sydney, Australia. The line up of bridges over the Tyne is one of the great transport views of the world, and a beautiful piece of large scale public art. It might not have been designed as such, but that’s what it is. I will brook no argument on the matter. This week’s entry is about none of the bridges in the picture above, however. Instead, this seems like a good opportunity to redress a long-standing failure to cover cycle and pedestrian transport infrastructure. This week’s entry, then, is about the newest of the bridges over the Tyne, easily one of the most attractive built in the UK in the last couple of decades, the Gateshead Millennium Bridge. In the run up to the Millennium (1999/2000 or 2000/2001 depending on your level of pedantry) a number of building projects were commissioned to commemorate the beginning of the third millennium. Some superstar architects like Lords Foster and Rogers were busy in London with projects that attracted some degree of controversy (the Millennium Bridge and the Millennium Dome respectively, though both have now settled down to become integral parts of the cityscape). Architecture practice Wilkinson Eyre, however, turned their attention north and delivered one of the most quietly successful of the Millennium building projects, the Tyne Millennium Bridge. It opened in 2001. 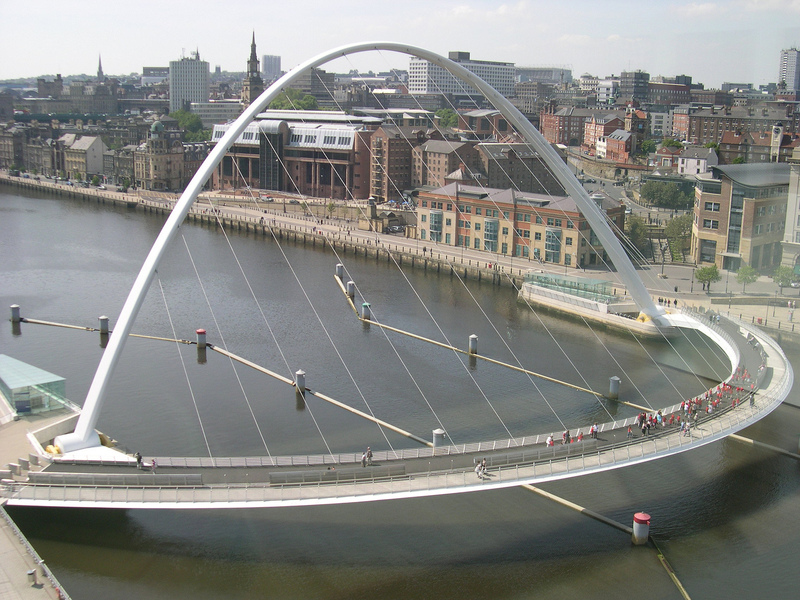 Driving the final design for the bridge was a need to connect to the north and south banks of the Tyne for pedestrians and cyclists; the bridge is a key link in Route 14 of Britain’s national cycle network. That meant it had to be a low level bridge. But it was also essential to keep the Tyne accessible for river traffic. That meant either a steeply arched bridge to provide the required headroom on the river (not a practical proposition for a cycle bridge), or one with a mechanical means of opening. Over the years, several distinct types of opening bridge have been developed. The most popular include drawbridges which pivot at one end of the raising section (like Tower Bridge in London, UK), bridges where entire deck lifts up, like the Kingsferry Bridge to the Isle of Sheppey (Kent, UK), and swing bridges, which pivot to provide a clear passage in the river. 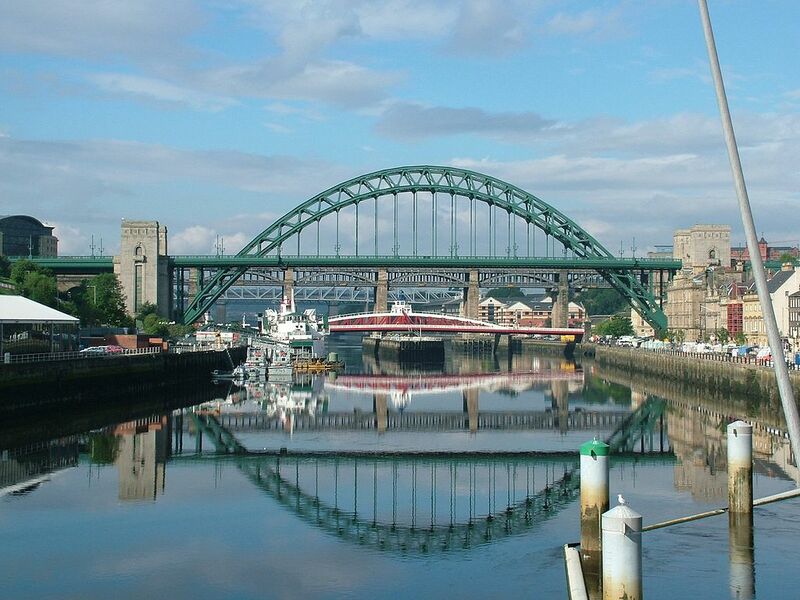 Newcastle-Gateshead already has one of the these, in the shape of the 1876 Swing Bridge. 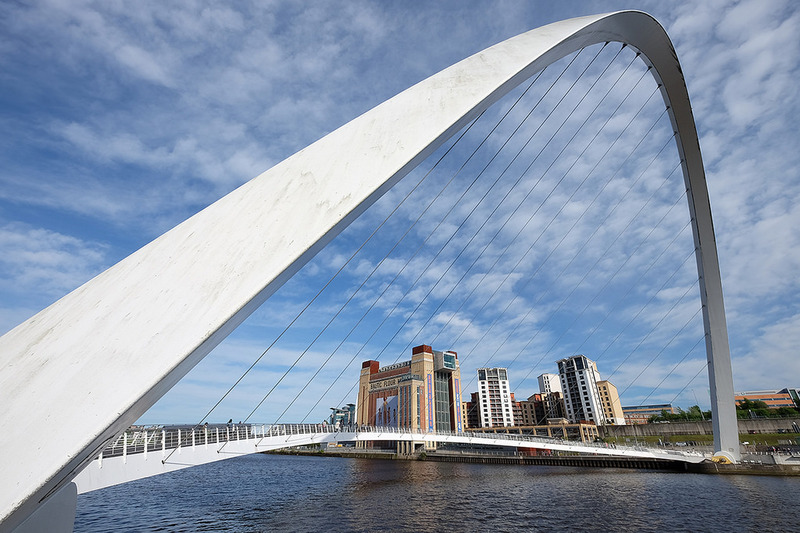 Wilkinson Eyre’s particular genius on this project was to conceive of a different way of lifting the Gateshead Millennium Bridge out of the way of river traffic. 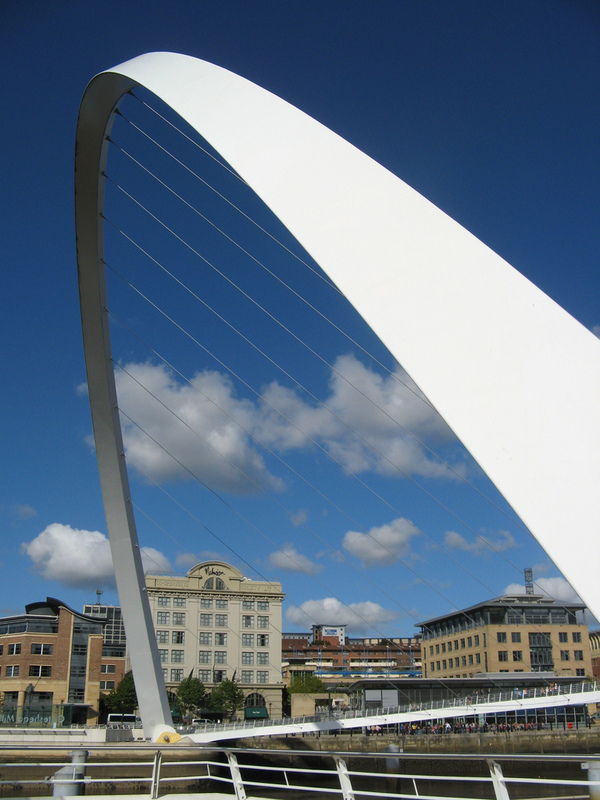 It was a beautifully elegant solution, and allowed for an extremely attractive, thoroughly modern bridge, which nevertheless sits very happily with the other bridges in the centre of Newcastle. 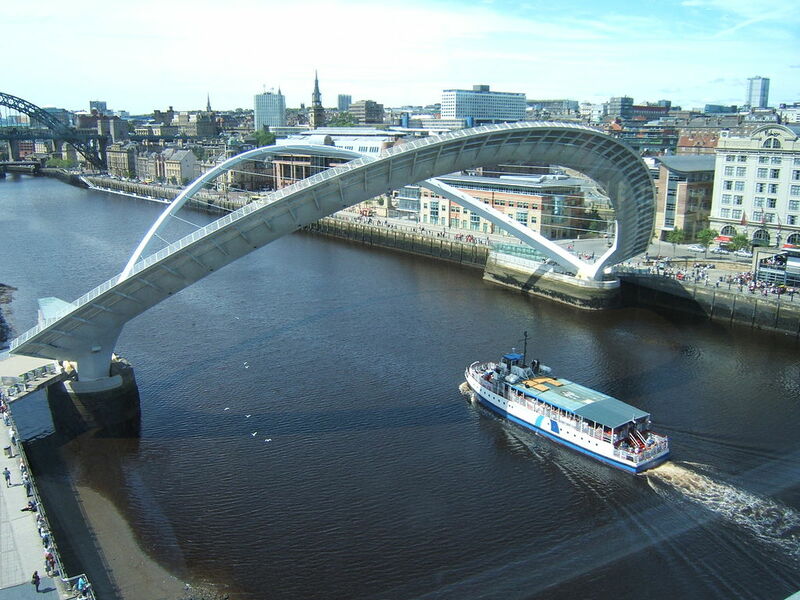 It also gave the bridge its popular nickname, the Winking Eye Bridge. When a bridge has a fond nickname bestowed upon it, you know it’s a hit. Wilkinson Eyre deployed their considerable structural ingenuity on the design (an ingenuity which would later be repeated on the Thames Cable Car pylons in London). They designed what is effectively a suspension bridge, with a 50m tall arch. Unlike a traditional suspension bridge however, the suspended traffic deck is not straight, but curves outward at more-or-less right angles to the supporting arch. The two are connected by steel cables, with the upright arch supporting the traffic deck. Because the traffic deck is laterally curved, its total length is 120m, compared to the 100m-or-so width of the bridge. Adding extra journey length for pedestrians and cyclists might not seem like a good idea at first glance, but it’s crucial to the really clever bit of the design. When river traffic needs to get through, the entire bridge pivots at its ends, just like an opening eyelid, a resemblance Wilkinson Eyre is happy to acknowledge (see here). The bridge rotates through 40º in four and a half minutes minutes, lifting the deck up from the river and forming a pair of arches through which river traffic can pass. It’s genius, pure and simple. It’s very white, gorgeous under a blue sky (I’m a regular visitor to Newcastle for family reasons, and I’m sad to report that I’m rarely that lucky with the city’s temperamental weather). As proved by the earlier photo, its arch references the Tyne Bridge and the arches on the sections of the High Level Bridge while belonging only to itself. The traffic deck is separated by steel panelling into two discrete elements, a pedestrian walkway on the inner (shorter) part of the curve, and a cycle lane on the outer part, while the whole rises and falls gently across its width, its highest point being in the middle. That’s so that smaller river vessels have enough headroom to get under the bridge even when it’s closed. The steel grate decking on the cycleway, and the steel cables running between the two arches, definitely lend a maritime feel to it. The North Sea is only a few miles away, after all. 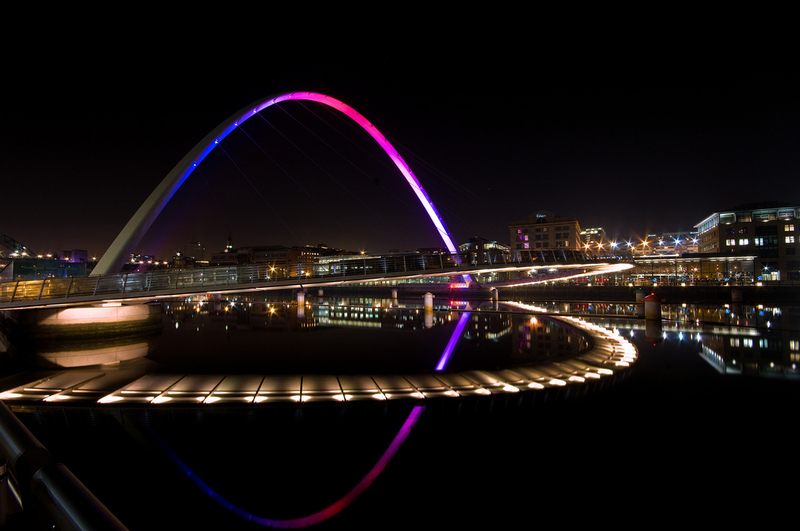 Not only is the Gateshead Millennium Bridge spectacular in the day, it’s equally striking at night. An imaginative lighting schemes sees it illuminated with multi coloured lighting. With a still river below, it’s quite magical. There’s something very apt about having a winking bridge in England’s friendliest city (that’s not the result of any official survey work, that’s according to, well, me). Spend any time around the Gateshead Millennium Bridge and it’s abundantly clear that local people love it, just as much as visitors are fascinated by it. They have taken it to heart just as much as the Tyne Bridge itself, and it’s now just as much a nationally recognised icon of Newcastle-Gateshead as the older bridge, along with another modern structure, Antony Gormley’s Angel of the North sculpture. When the Royal Mint chose one bridge from each of the constituent countries of the United Kingdom to feature on a series of four £1 coins, it was the Gateshead Millennium Bridge that was chosen to represent England (another the beauty of transport bridge, the Forth Bridge, was Scotland’s). To be honest, the small size of the £1 coin doesn’t really do the bridge justice. It’s much more elegant at full size than it appears on the coin. The bridge won the Royal Institute of British Architects’ Stirling Prize in 2002, and several other awards too (see here). The only disappointment on the opening of the Gateshead Millennium Bridge was to be found in the river below. Not part of Wilkinson Eyre’s plans at all, the Port of Tyne harbourmaster had decided that the bridge needed protecting from carelessly piloted vessels, and installed the plonkiest and most unsubtle means of indicating the correct course under the bride (i.e. the middle, duh…). When it comes to ruining beautiful design through an over-reaction to perceived threats to public safety and security, by employing the crassest and ugliest hard engineering that can be dreamt up, the UK really is a world leader. These ridiculous river bollards and connecting booms were basically like putting a paper bag over Helen of Troy’s head. They can be well seen in my photo of the bridge taken from the Baltic arts centre, above. Surprisingly, however, there has been an outbreak of common sense. The bollards have been removed (the last one went in 2012) and the bridge can now be seen in all its elegant glory, without visually intrusive distractions, just as Wilkinson Eyre intended. You would need to contact the individual photographer of the photograph you want. The caption under each photo links back to either Wikimedia Commons or flickr, from where you should be able to contact the photographer.